Many times since my husband’s unexpected departure to heaven 7 years ago, the lyrics to the famous Beatles song, “Let it Be” has resonated with me. There have been several challenges along the road of life as I navigate the whole mother/father/working thing with my son who is now 12. I’ve come to realize that accepting the reality of the situation is the first, and often the hardest step. But listening to this song on my iPod, sometimes over and over again during really difficult periods has always helped. Accepting the loss of our loved ones will be the hardest thing that most of us will ever face in our lives. But it is in the acceptance of the reality of the loss, that true healing can begin. And with enough time, we may hear words of wisdom that help us today and there will be an answer for us to feel hope for tomorrow. 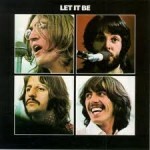 And when the night is cloudy, there is still a light, that shines on me,Let it be, let it be, …..